Baseball, perhaps more than any other sport, is defined by its stories. None of our American pro sports leagues have the same lengthy history within the culture. Nor do they have the same reverence for that history. Baseball is about narrative, a constant tale-telling that is built around connecting the present to the past. Ron Darling’s new book “108 Stitches: Loose Thread, Ripping Yarns, and the Darnedest Characters from My Time in the Game” (St. Martin’s Press, $29.99) is about telling those stories, all through the lens of his own experience in the game. And he’s got plenty of experiences to talk about – a 13-year major league career where he won 136 games as a starting pitcher and two decades in the broadcast booth. Darling’s conceit is a simple one: A series of stories about the various figures with whom he crossed paths over the course of nearly four decades in professional baseball. 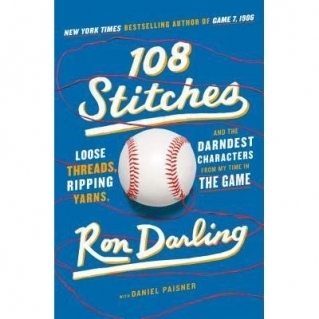 All told, there are 108 tales – just like there are 108 stitches on a baseball. These stories range all over Darling’s baseball timeline. He tells stories of former teammates and managers, spending much of his time discussing his eight seasons with the New York Mets. Darling talks about his four-year run in Oakland some, but his focus is largely on those Mets teams of the mid-1980s. Dwight Gooden, Darryl Strawberry, Keith Hernandez (who also pops up in Darling’s broadcasting stories) and so many more Mets – some less well-known than others – appear throughout. They’re all fairly short snippets, snapshots of a life lived in the big leagues. The book is fashioned as a sort of “Six Degrees of Ron Darling” game, where he offers up tales of people who have crossed his path. Some of these interludes are lengthy, where Darling goes deep on his feelings regarding certain players and managers who have been a part of his baseball experience. Others are more ephemeral, as Darling had just a brief interlude with them before the moment passed. And while those lengthier stories are engaging and fun to read, the briefer tales are almost more interesting in their way. There’s something fascinating about the transient nature of professional baseball; with players and coaches moving from team to team, there’s a steady stream of these figures on the fringe, people who quietly appear and quickly duck out again just as quietly. Hearing Darling’s memories of THOSE guys, the transitory figures … it’s nice to get some deeper cuts. But of course, “108 Stitches” isn’t just about these other people. It’s also about Ron Darling’s connection to them. Throughout, we’re allowed a glimpse into Darling’s memories – by recalling these players from his past, he can better contextualize the recollection of his own career. We get stories of moments on the mound, yes, but we also get tales from the dugout and the locker room and the broadcast booth. We even spend some time with Darling outside the stadium as he adjusts to being a young kid living in Manhattan. While he spends plenty of time sharing his thoughts about those he feels helped him along the way, Darling is also unafraid to make his feelings known about someone he didn’t like. Truth presented in an unvarnished form is always going to rub some the wrong way, though to be fair, he doesn’t let himself entirely off the hook. It’s worth noting, however, that there are a couple of stories in the book that have drawn considerably more attention than the rest. One in particular involving a former teammate has been a bit of a lightning rod, with vehement denials and threats of lawsuits and whatnot. Still, with a few exceptions, the book is largely celebratory in tone, embracing a “for love of the game” attitude that’s hard to resist. “108 Stitches” is an old-fashioned baseball book from an old-fashioned veteran of the game. Darling is an intelligent, old-school baseball lifer, one who loves the game and loves what it has given him. This book is an entertaining guided stroll through some 40 years of one man’s baseball memories, a fun read for any fan with a fondness for the game’s rich narrative tapestry.